There are two really strong players in the market who have reached very high efficiency up to 20%. The monocrystalline solar panels with dark black cells with octagonal shape and polycrystalline with light or very dark blue cell. The polycrystalline panels don’t have uniform colour, this is the result of the manufacturing process. The more uniform colour they have the better the panel. The monocrystalline panels used to be better than polycrystalline but this statement is not valid anymore. Each panel should be evaluated and checked on case by case. The buyers should read and understand the technical characteristics of the panels (there are many useful information in the data sheets). In addition, it is strongly recommended to buy from “Tier 1” manufacturers who invest in research and development and use automated vertically integrated production lines. More information on Tier 1 manufacturers is available here. As you can see the efficiency of polycrystalline modules is not far from the monocrystalline. The average difference in efficiency between the panels is only 1.5%. The clear winner is the new “all black” monocrystalline photovoltaic panel from EGING PV but as we explained earlier, a TIER 1 manufacturer invest in technology and research and continuously optimises the performance of their panels. EGING was focused this year to produce an ultra efficient panels that comes at a very competitive price (around €0.62/Watt, £0.49/watt, $0.72/watt). Solar System Efficiency and the contribution of the panels. How important is the efficiency of your panels? It is quite obvious that panels are not working on their own, they are connected το solar inverters and long runs of cables. There are also other parameters that affect the performance of the system such as the number of panels in series and parallel, shadowing effects and natural ventilation. 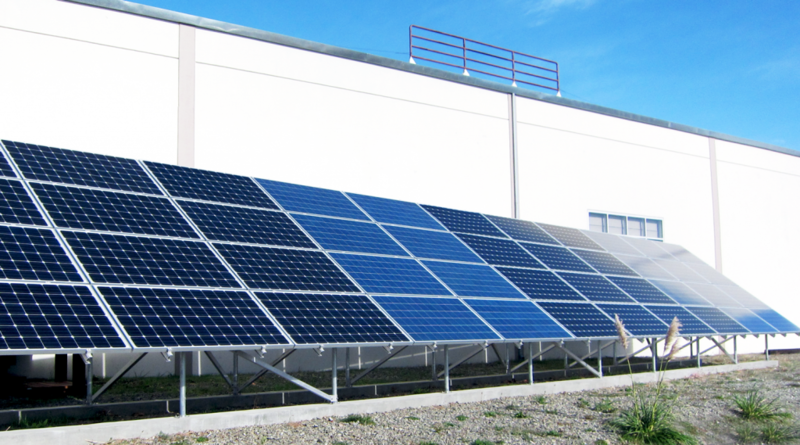 If you have a large solar roof or ample space in a field, the peak efficiency of the panel is not the fundamental factor for the solar system. Instead of buying a very expensive panel with 20% efficiency, it is preferable to install a few extra pieces of good quality 17% efficient panels. The conclusion is that solar installers should consider the solar system from the panels to the inverters and balance the cost with quality. If you are concerned about the budget, then it is better to look at the euro or pound (£) per watt of the complete installed system. We had a fair bit of theory so far it is time to provide you with proof and really measurements. Voltacon is 100% green and environmentally friendly company, we generate our own electricity using solar panels and nothing else (not even 1 litre of gas or diesel or other fossil fuels). We compared under the same environmental conditions, in the same location two PV arrays, one with polycrystalline modules and an adjacent array with monocrystalline. Graph 1: Energy productions from Polycrystalline Vs Monocrystalline solar panels. Cloudy day with sunny spells. Your blog is much effective and thanks for sharing information. Thanks a lot for the brilliant writing. I have shared it on my facebook page.